Commuting by bike can be a very enjoyable way to get around town – relaxing, refreshing and freeing. Much has also been said about the benefits that can come from exercising regularly – particular towards wellbeing. With cycling being a very popular form of regular exercise – it can be helpful as both a cyclist or, someone who may be interested to soon take up cycling, to become familiar as well as more aware of the reasons as to why you may want to begin to become involved as well as to continue to be involved in this very positive and indeed very beneficial form of exercise. Not only relating this to wellbeing, it can improve many aspects relating to creative thinking as well as of course – endurance. It can aid in clearing the mind as well as indeed be a great way to socialise with others. Whether it be cruising with mates on your commuter bikes, or, a relaxing ride with the family on a trail riding adventure – it isn’t difficult to begin to understand that the benefits of cycling can extend beyond those aspects that may first spring to mind. Read on to hear five reasons as to why you may like to get out on your very own two wheeled cruising machine. Research shows that those who cycle regularly may be at a significantly lower risk of diseases such as cardiovascular disease, type-two diabetes, all types of cancer, high blood pressure as well as, obesity. In particular relating to heart disease, it is said that cycling just 20 minutes per week can in fact reduce the risk of heart disease by less than half when compared with those whom may undertake no form of exercise. Research related to those whom suffer from insomnia, reported that a regular bout of cycling for 20 – 30 minutes can work to reduce the amount of time it takes to fall asleep by half the amount of time. In addition to this, sleep time was seen to increase by a duration of almost one hour. Whether it be riding a commuter bike, or a cruiser bike – at Lekker we believe exercise is still indeed, exercise! Exercise such as riding a bike can indeed assist you in such areas as creativity. From solving mental blocks to assisting you in making decisions – exercise is said to increase the flow of oxygen to the area of your brain known as ‘grey matter’. This can allow neurons to spark and in turn, leave you with a little more space when it comes to dealing with the pressures that may be present within your life. Cycling overall, can be a great way to clear the mind and in doing so – to arrive to whatever work it is that you may be doing, with a greater sense of ease and, clarity. The social side of cycling may in fact be just as beneficial to you as, the actual exercise itself. Research has indeed shown, that socialising with others – releases the hormone known as ‘oxytocin’ which is said to buffer the ‘fight or flight’ human response. The act of cycling in particular – can be a great form of exercise to do with someone else. Whether it is with your partner, a family member or simply a close friend – getting out on a two wheeled commuter bike or a cruiser bike, or, simply any form of bicycle with someone else – can be a great thing to incorporate into your social activities. Your end destination too, could indeed be a spot for lunch of simply, a café to grab a cool iced-latte for an enjoyable post-cycle chat. In addition to this – whichever city you may be in – cycling clubs too, can be a great way to combine riding with being social. Whether it’s a more organised Sunday morning riding group or, you’re even interested in beginning something yourself with some friends of yours – creating or being involved within a cycling group or club, is indeed a great way to incorporate socialising, with riding. It is said that mild-to-moderate exercise can naturally release feel-good endorphins that can help you in countering stress as well as to increase your sense of happiness! Compared with three years ago – it is also mentioned that GPs are now most commonly prescribing ‘exercise therapy’ as their most common treatment regarding, depression. Studies looking closely at endorphins and the effects of exercise has shown that there is an increase in opiate-binding of the ‘happy hormone’ – found within the frontal and limbic regions of the brain. These areas are known particularly, to deal with emotional processing along with stress. Along with the four previous benefits involved with riding a bike – of course there is the old fashioned improvement in, fitness. Undertaking hill-riding in a big gear can work to improve strength or, shorter sprints standing up from the saddle can work to increase the heart rate. In addition to these – a longer, steadier ride can work to increase overall riding endurance. 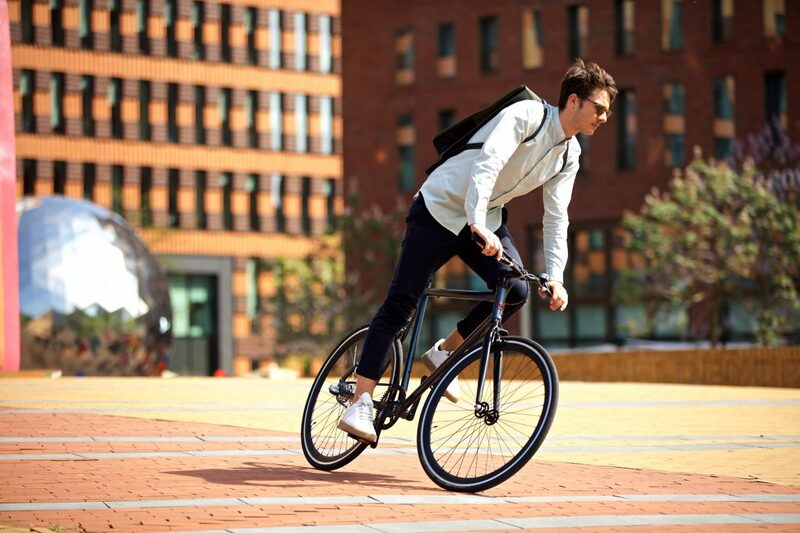 With all of these styles of riding either – both a cruiser and a commuter bike can indeed be suitable. As at Lekker – our bikes are designed for the wide variety of uses that we understand they may be used for. With cycling too – being a non-impactful form of exercise, it can also be a very beneficial activity to build fitness relating to other sports. Whether it be tennis, or soccer, cycling’s benefits can really work to carry over into a range of different areas that extend beyond just the activity of cycling. Here at Lekker we hope that the above outlines to you some of the benefits involved in getting on a bike! Whether it be checking out one of our commuter bikes or, cruiser bikes, we invite you to pop into any one of our brand-stores to take a test-ride for yourself. Experience our extensive range and take a test-ride on us. Absolutely, free.